Goal: Create a wireless system to give enforcement officers in the field, hundreds of miles away from headquarters, access to all the department's databases and other computer resources. Obstacle: Maintaining a connection out in the field is next to impossible as officers move in and out of coverage from various wireless service providers. Solution: NetMotion's software NetMotion Mobility XE enables wireless users to roam from connection to connection without applications crashing. The software also lets officers work in applications when a connection is lost, automatically reconnecting when a carrier is available. Payoff: Enforcement officers have access to the information they need, and they don't waste time driving to a department office to do tasks that now can be done wirelessly. A Washington state Fish and Wildlife officer stays in touch with the regional offices using a new wireless data system. Tasked with protecting 800,000 acres of pristine land at sites dispersed over Washington state, enforcement officers with the state's Department of Fish and Wildlife do not have the luxury of going to headquarters in Olympia every time they need to check a database or download a file. Many of the department's 140 officers who protect wildlife resources, monitor hunters and fishermen, and observe construction projects near delicate habitats, only make it into headquarters twice a year, said Fish and Wildlife Capt. John Broome of the department's enforcement division. Field officers have relied on radios and telephones -- and more recently on AT&T Wireless data service -- to stay in touch with the department's regional offices. But sometimes they had to drive hours to regional offices to file reports. Creating a wireless data system for the officers was critical. "Wireless data enables them to stay in the field and be more effective in their use of time, and that clearly has some cost savings," said Aaron Burnett, senior director of marketing for Seattle's NetMotion Wireless Inc., the company that provided software for Fish and Wildlife's wireless system. NetMotion's Mobility XE software lets any application, even one designed for a wired connection, work over a wireless network, Burnett said. 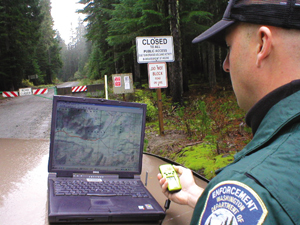 In the Fish and Wildlife deployment, the wireless system gives officers access to the kind of information, such as licensing records, arrest records, outstanding warrants and more, that police officers in the field have had access to for years. "When they come upon someone in the middle of the woods who happens to be armed because it's hunting season, they can determine whether this person has a valid hunting license and what their criminal history is," Burnett said. In addition to a system to access and send data wirelessly, Fish and Wildlife officials also needed a system that offered application persistence, in which wireless applications did not crash every time the connection was lost. Because officers can go for months at a time without seeing one of the department's IT professionals, the system also had to be easy to use. [IMGCAP(2)]NetMotion's software offers such application persistence. Should an officer go out of range while using an application, all data input is saved, and, once back in range, the officer can continue without restarting the laptop or other device. "When you come back into range, the application is up, and you can pick up where you left off," Burnett said. "And we can do that over extended periods of time. The default level of application persistence is seven days." Another obstacle Fish and Wildlife officials faced in developing the system was officers moving from one wireless network provider to another, such as from AT&T Corp. to Verizon Communications Inc. Enforcement officers are always on the move, so logging into multiple networks multiple times during a shift would be cumbersome. NetMotion's software supports roaming from network to network in the background, without the officer being aware of it. Mobility XE also handles dynamically assigned IP addresses. The Code-Division Multiple Access system offered by carriers such as Sprint Corp. and Verizon is based on use of dynamically assigned IP addresses. However, the organization needs a static IP address to send data to a mobile user. NetMotion's software solves the problem by handing out virtual static IP addresses to mobile users. The virtual static IP address is maintained as long as the mobile client is logged onto an organization's network, and despite any roaming from one wireless carrier to another, or even total loss of coverage. Fish and Wildlife officials also needed security features to protect critical databases. The Mobility XE system incorporates standard logon security measures found on a wired network, NetMotion's Burnett said. "We provide a wireless virtual private network that behaves just as the application does," he said. "When you roam in and out of coverage, or network to network, the VPN, in effect, roams with you. When you come back into range, it automatically authenticates to the newly available network." Although the Fish and Wildlife department used its own staff to install and integrate NetMotion, several systems integrators have used the software for a variety of government applications. For example, Feeney Wireless of Eugene, Ore., began installing mobile computing systems for public safety and utility departments when the only technology available was radio frequency data communication, said company President Bob Ralston. Now the company installs mobile systems, including hardware, mounting brackets and software like Mobility XE. "Not only is it the tool people in the field need, organization's administrators aren't being inundated with support calls," Ralston said. NetMotion's opportunities are increasing, Burnett said. For example, building inspectors in the field are using it to get detailed information about structures and their owners. NetMotion, which has about 50 employees, was established in 2001. Since August 2003, NetMotion's customer list has increased from 70 organizations to more than 500, Burnett said.